Protein is often overplayed in sport. From the time of Charles Atlas and leather head football, a lot of athletes have been told they should consume much more protein on a daily basis than they really need for optimal performance, and even for good health. 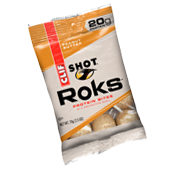 So, it was with some trepidation that I started testing out a (full disclosure: complimentary) sampling of Clif Shot Roks (Clif site), bite-sized protein "balls" geared toward athletes looking for a protein boost either after a big endurance effort or in the midst of one. And despite my slightly jaded eye going into things, I realize protein has an important place in one's diet, and I have some positive things to say about the Roks. First, they taste quite good. My sampling included chocolate and peanut butter flavors, and with their hard(ish) outer shell and chewy insides, they taste how I envision a healthy malt ball might taste. In fact, as I write this I'm noshing on some. Second, they offer a lot of control over intake. With ten pieces to a pack, each ball has 2 grams of protein - a little over what Succeed's Clip 2 has per bottle (1.6 grams). So during a race you can throw a couple in each drop bag as you need them, and post-event you can dose them out as your stomach and appetite dictate. Finally, they're made up of largely healthy protein. While burgers and steak and bacon can taste really good after a long race, they're not the healthiest option for regular protein replenishment. The Roks, on the other hand, are made up of milk-based protein, which makes them pretty healthy (save some cholesterol). Via Twitter, I know of one ubiquitous and esteemed ultrarunner, blogger, and vegetarian who really enjoys the Roks as a healthy source of his needed protein. Of course, there are many other sources of protein for ultrarunners to choose from both during and after a run. A lot of sports drinks have one or two grams per bottle. A peanut butter and jelly sandwich has about 15 grams of healthy protein. And a Burger King Whopper has about 29 grams of unhealthy, though at times very tasty, protein. Still, it's never bad to have another arrow in the quiver. It's hard to tell sometimes what's going to work when, so throwing some Clif Shot Roks into your pack, mile 38 drop bag, or glove box could be the ticket to getting the protein you need right when you need it.